This image is an extension of the 'silver study' version of the image. So many things attracted into creating this image, but some were only realised after capture once I viewed the image on my computer. The composition is the first thing to draw the eye in. To me, it was the juxtaposition between the Grandes Jorasses peak and the diagonally opposing shadow of the Arete in the foreground. 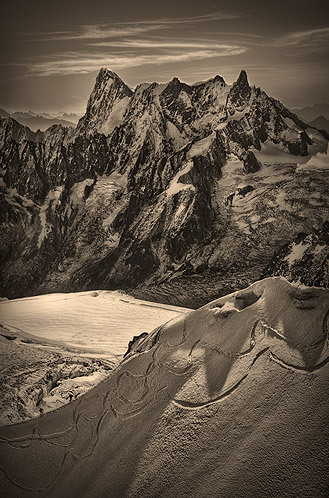 For others however their eye starts in the bottom left corner with the ski tracks, moves 1/3 the way up the image, then they're taken on a journey through 6 climbers on their way to the vast snow field. Then we discover the details in the jagged rocks and glaciers on our way up to Grandes Jorasses, and via the whispy clouds shaped like an S, our eyes 'exit' the image at the very top right. It amazes me that we are able to deduce the simplest patterns from even the most vast natural scenes.